Go-to blue with on-trend, smart texture. 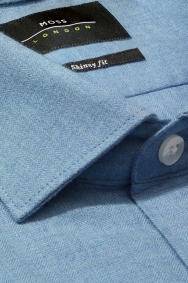 Adding another versatile blue shirt to your formal wardrobe is never a bad plan. This Moss London choice offers more than most thanks to its twill weave and cutaway collar combining to deliver a great on- or off-duty piece. Skinny fit tailoring means it sits close through the sleeves and body, creating a contemporary profile. A navy tie is a simple and effective option if you’re keeping things formal for the office. 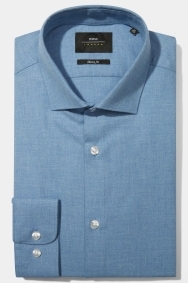 Go for a skinny one to match this shirt’s fashion-forward cut.